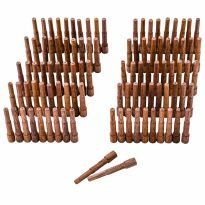 A variety of spiral dowel pins with stronger joints due to greater distribution of glue. Made of hard maple. Chamfered ends. Dimensions listed by diameter x length. I like the grooves. Helps with glue. The spiral ones seem to carry more glue into the joint and hammer in with no push back. Work well for what I needed them for- making boxes, frames & edge glueing boards for bench tops. These worked perfect for replacing tenons on pool cue shafts. Shipped quickly and was informed throughout the processing. Rockler was the only place I could find longer dowels. My daughter asked if I could make a jewelry hanger that she could use to hang her new daughters headbands on. I was looking for longer 3/8” dowels and Rockler was the only place I could find them. Worked great! I ended up making 2, one for my other 1 year old granddaughter. Fortunately they were sold in a package of 50. Wall hanging jewelry hanger with Rockler dowels. Perfect for the job I needed and a very affordable price too. I wasn't familiar with Rockler until I needed this item. Store is a woodworkers dream. Very friendly staff too. fit the hole. look good. Most of the dowels I buy are fluted which seems like a good idea. These spiral ones may be even better. The 2 things I used them for so far came out great, but are only a week old, so check with me again in 10 years. $4 for dowels, some Titebond III, and a few days to repair a bookshelf, and now my in-laws think I'm a master woodworker. I'll call that a win. All the sizes you need are here. perfect fit. Worked as expected. These worked pretty good for me, though every time I tapped one into a hole with glue, it got stuck. : < ) Would buy again for sure if needed . . . .
Just what I needed for joining my cabinet frame together. work wonders with the right doweling hole jig. Beveled ends makes insertion easy. Spiral allows glue to seep out. Good quality, consistently true to size and good glue groves. great dowels, great shipping good experience with Rockler. Shopped specifically for the twist cut dowels for my project and so far have used nearly the entire bag. These tapered and spiralling grooved dowels are the next best thing to sliced bread; making joining easy and strong at a fair price. I like the Dowel Pins and used a lot of them building my gun cabinet. The take glue well and seem to hold good. I'm using these to assemble cedar outdoor benches. 42 dowels are required. the 3/8" X 2" are critical to me. These filled the bill perfectly. Well Made and worth it ! Used two sizes for a rather large project. Found them to be a consistent size and good quality. Great Quality at a Great Price and Service! Used these pins to pin together some 50 year old wood I was using to make a stargazer chair from. Worked perfect - strong and with the doweling jig accurate. Ive made my own pins before but they were never this perfect. The rods Ive bought were never the exact same thickness they claimed to be, close but not close enough. I would either have to sand them or use a hammer and tap them into place with alil more force then I wanted to use. These fit perfectly just a nice firm push or a gentle tap with a hammer and they slide right in! 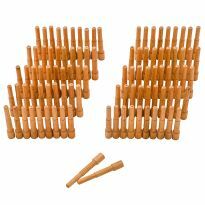 I ordered these dowels to replace missing dowels from an IKEA bed frame. The IKEA dowels were horizontally grooved as opposed to circular but the subs worked perfectly! Thank you! I designed and built an 8' x 10' Kingman AZ Cancer Craft Fair show booth with 6 48 x 96 white plastic lattices hanging on the frame for displaying my wife’s wreaths and needed many 3/8 x 1-1/2 spiral Dowel Pins to locate all of the details during assembly at the fairgrounds. My design consisted of 16 sub-assemblies that pinned together using these dowels and hex head cap screws with blind nuts and threaded inserts. All of this, when broken down, fit nicely into a transfer cart in the reverse order of assembly for ease of assembly later. 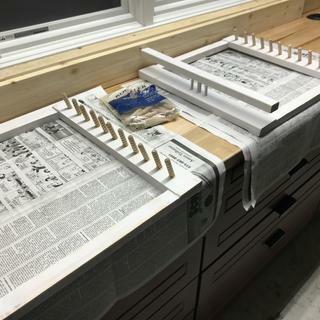 The 3/8 x 2-1/2" spiral dowel pins were also used in the transfer cart along with special cut keys to position each detail and secure from moving and damaging other details. Used many, many times and love them. I feel they make a stronger joint than biscuits. Appear to be well made and accurate. Fast service, dowels fit, and appears they will accomplish their purpose. What can I say, they work as designed. Using for leg alignment on picnic tables,... work great. Excellent overall product. I've been using them for my joining needs for Christmas projects, and would recommend them highly!!! Used to assemble a reloading bench. Worked great. The diameter was just right for assembly without modification. Easy to use and holds extremely well. Repaired some old oak dinning chairs. Worked great. 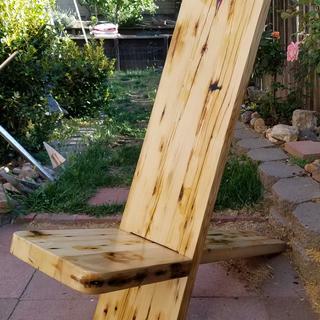 The chairs came out very well. These dowels were used to make a set of dining chairs, worked great. These work well for me. The spiral cut in the dowel pins seem to make the contact between the glue and the wood pieces much stronger, I believe that this design helps create a small suction between the two pieces making a tighter bond and seems to work better if you don't twist the dowel as you position it into place. I will continue to use this product in many future projects. 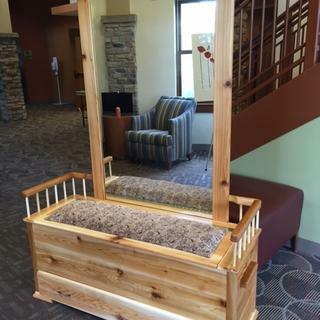 This is one of my projects in which I used dowel pin joinery, this is a cedar hall tree. My next project involves 1" thick material. I need 36 of them to assemble a small walnut table. I had to repair a chair. Use them all for all my joints requiring dowels. my husband uses them to build furniture. These work very well with my Dowelmax jig and I am finding other applications for dowel joinery. I am lumber banding plywood and I wanted a secure attachment. 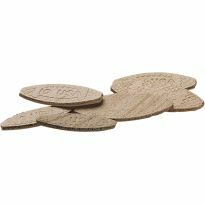 Need the for a project and could not find them locally. Spiral design. I don't know whether pins are made of maple or not. Assume they are You are a reliable vendor. Update: verified that they ARE hard maple. Used these many times in the past, fit a little bit better than the fluted types. 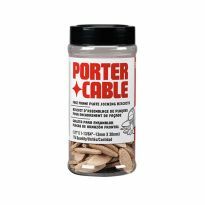 the hardware store doesn't stock enough of this and I am always guessing when they will have some. I also like the spiral design. I want to try a dowel which has grooves cut into the sides in order to help ensure more glue is in contact with both wood pieces. These are the sizes supported by the jig I just bought. I need these for a current project. Distributes glue better than the fluted type I think and I can't get these around here easily. i need maple spiral dowel pegs in 3/4" by 2 1/2 " ? 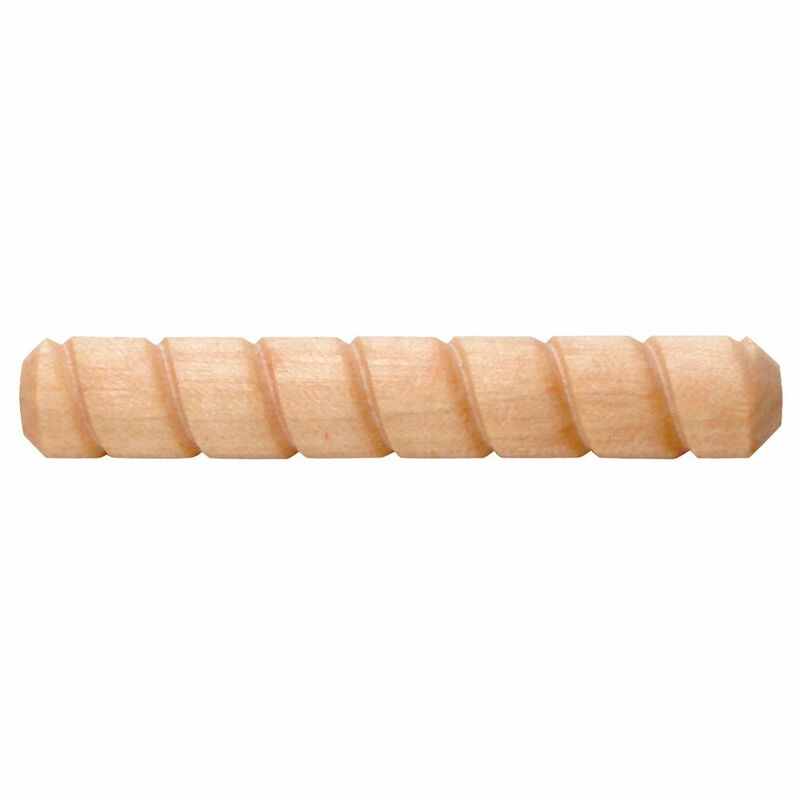 and 5/8" x 2 /1/2" maple spiral dowel pegs ? I haven't had much luck here. I usually just buy a dowel rod and make my own dowel pins in that situation. What species of wood are these made from? Maple? 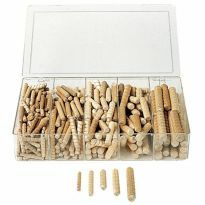 BEST ANSWER: The Rockler website and the packaging state that the dowels are maple. The ones I received where made from pine. They worked very well.